WSJSociety.com is almost two months along. There have been some good experiences and some frustrating ones. 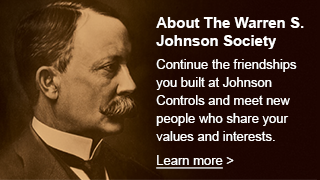 Membership is up a bit, 3% to 538; more than 24% of the membership, 131 have logged in to WSJSociety.com; and we have received more stories and notes from you than we have in a long time. You will find them online and in the Newsletter. Those are some of the good experiences. Some of the frustrating ones involved the login process. It was a bit confusing. Thanks to those who commented on their experiences, that has been changed. Those logging in for the first time should encounter a clearer process with more explanation of what needs to be done and where they are in the process. Username was also an issue. For existing members logging in for the first time, the username was assigned. They could not select it and there was only a brief statement that it was the means for all future logins. All new registrants will now be able to select their own username. Also, login with your registered email address was added as an alternative to username. Changing usernames is not a good practice and they need to be unique within the system. However, for those of you who were not able to select your username, and would like to do that, please submit a Help request and include the username you prefer. I will check for uniqueness, make a one-time change, and notify you by email reply. Now, our next challenge is to get engaged. There are many members who stopped by, but didn’t say hello. There are pictures going up and some profiles started, but very little communication. That’s not entirely unexpected. It takes time to build a community, even an online community. Checkout the Groups that have been created. Is there one that might interest you? It’s easy to join a Group. Not sure how to use the features? Visit The User Group. WSJ has a post there that includes a link to a User Guide you can view online or even download. What’s New will keep you up to date on new content and features on the website. The World Series is coming and Paul Froehling has a Baseball Group. He loves to talk baseball – take him up on that. Do the same with my Gardening group. Have a good story about your experiences at JCI? Tell it in Stories Worth Repeating. Have you read a good book lately? Share it in The Library. Do you have an update about someone we know, including yourself? Write a quick note in People We Know. Want to ask the membership a question? Do that in Open Forum a great place for us to help each other. Something I’ve learned over my career and in retirement is that there are many ways to make a difference for others. That’s an interest we all share, those in mid-career and those a bit further on. Sharing your experiences in Making a Difference may help another member find just the right thing for them to contribute. Start a company, volunteer, get a job, provide care . . . with a purpose, there are lots of options. Let’s talk about what you’ve found in Making a Difference. Thanks to you all for your patience and interest in our start-up community.